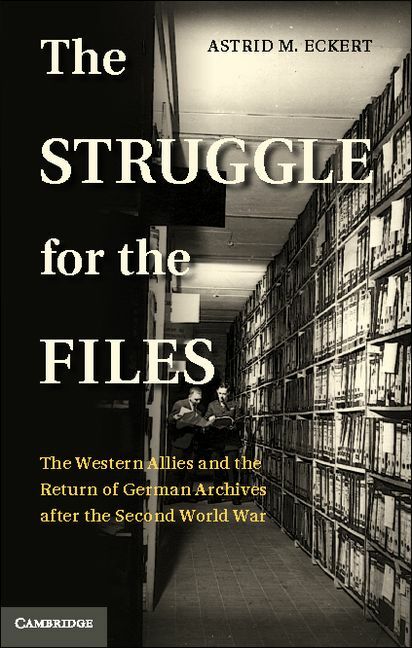 "The Struggle for the Files: The Western Allies and the Return of German Archives after the Second World War" by Astrid M. Eckert, a history professor at Emory, is now available from Cambridge University Press (as well as Amazon). This is the definitive work on the return of the German archives seized by the Allies during WWII and is a must read for anyone interested in the history of captured documents. You don't have to take my word for it. In his 2006 review in Central European History of the German version - Kampf um die Akten. Die Westalliierten und die Ruckgabe von deutschem Archivgut nach dem Zweiten Weltkrieg - the Joint Historian for both the State Department and the CIA, James C. Van Hook, called it a "study of profound importance to the historiography on twentieth-century Germany" and "truly a remarkable achievement." He ended by stating: "One may only hope that Eckert's work gets the widespread attention it deserves. This is one of the best books I have read in the past few years." From the publisher: When American and British troops swept through the German Reich in the spring of 1945, they confiscated a broad range of government papers and archives. These records were subsequently used in war crimes trials and published under Allied auspices to document the German road to war. In 1949, the West Germans asked for their return, considering the request one of the benchmarks of their new state sovereignty. This book traces the tangled history of the captured German records and the extended negotiations for their return into German custody. Based on meticulous research in British, American, and German archives, The Struggle for the Files highlights an overlooked aspect of early West German diplomacy and international relations. All participants were aware that the files constituted historical material essential to write German history and at stake was nothing less than the power to interpret the recent German past.